Growing up at the Jersey Shore (Joisey to all my homegirls) and now living in Southern California, beach life and coastal décor is near and dear to my heart. To me, coastal means playful, inviting, and with a hint of ‘perhaps there is a refreshing ocean to jump into right around the corner’. But if you go too literal with your beach-inspired design, I think you run the risk of it feel tacky and touristy. So, balance is key and for me, the secret weapon to achieving it is adding a touch of black (which is just a good rule of thumb in general). 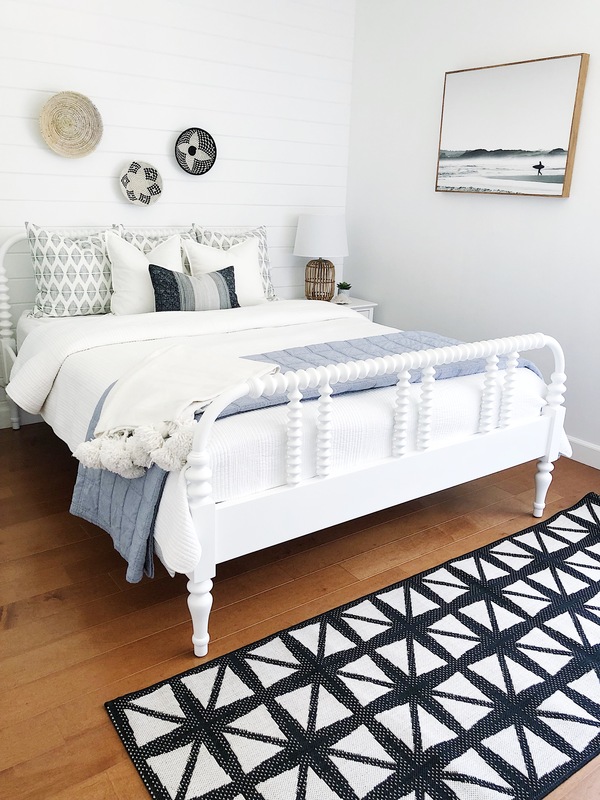 I had the opportunity to do just that in my mother’s San Diego guest room and styled the room a few different ways before settling on the right one for her. While she appreciates beautiful spaces (I have fond memories of her tearing out and saving pages from Pottery Barn catalogs), she will be the first to admit she has a hard time putting a whole room together. So, I was more than happy to do a makeover takeover. My mother loves herself some coastal décor. Seaglass, starfish, surfboards and a wood cut-out sign that reads “Relax” can be found around her home. So I wanted to deliver that beachy vibe she craved but also needed to push her out of her comfort zone a little bit. She was totally on board with the white shiplap (that was an easy sell because for frick’s sake it has the word “ship” in it). Now to convince her to incorporate black into the room. Wait, isn’t that the antithesis of sunshine and salty hair?? I knew she would fall head over heels with the artwork and that was a small victory for the dreaded b-word. Then I crept more black into the space with the wall baskets, pillows and finally the rug. Yet the room still felt like and bright because of all of the white. Added in a hint of nautical blue and voila! This is ultimately how I left her San Diego, beach-inspired guest room. A little bit of her, a little bit of me, and a dose of Vitamin Sea. Hi! Where are the quilts from on top of the bed! They look so cozy! Hello! Where did you get the light grey throw and natural quilt on the second picture? Trying to copy this room to a T, I love. Also, have you seen any good look-a-likes for this bedframe? It’s adorable but above by budget. Thank you! the throw was from homegoods. i have seen a similar bed on crate and barrel kids.